Our bodies become dehydrated when we lose more water than we take in. Staying hydrated allows the body to regulate temperature through perspiration, maintain blood pressure and eliminate waste. 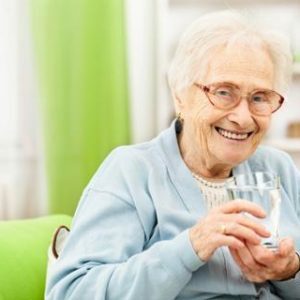 Dehydration may show only small signs outwardly, but it can have dire consequences on the body, especially in the elderly. Severe dehydration can lead to confusion, impaired cognition, falling, urinary tract infections, constipation, pneumonia, bedsores in bed-ridden patients, and even death. It can accelerate or cause emergency hospitalization and/or increase the length of hospital stays. As we age, the amount of water in the body decreases. The elderly are often less thirsty, which leads to consuming fewer fluids. They may be on medications that act as diuretics or cause them to sweat more. As we get older, our kidneys are less able to conserve fluid, especially during water deprivation. Specific conditions can contribute to dehydration. These include comprehension and communication disorders, reduced capacity and incontinence. Frail seniors, and those with decreased mobility, may have a harder time getting up to get a drink when they are thirsty. They may rely on caregivers who don’t sense they need fluids. Illness, especially if it involves vomiting and diarrhea, can quickly cause an elderly person to become dehydrated. Outward symptoms of dehydration can include confusion, difficulty walking, dizziness or headaches, dry mouth, sunken eyes, inability to sweat or produce tears, rapid heart rate, low blood pressure, low urine output and constipation. Urine color should be light and clear; dark urine or infrequency of urination is a common sign of dehydration. You can check for dehydration by pulling up the skin on the back of the hand for a few seconds; if it does not return to normal almost immediately, the person is probably dehydrated. Not everyone needs to drink eight glasses of water every day. Generally speaking, larger people need to drink more fluids than smaller ones, and it doesn’t have to be just water. Many fruits (especially watermelon), vegetables and soups are mostly water-based. Coffee, tea and flavored waters also count. Some seniors may need to be encouraged to drink even when they’re not thirsty. Include drinks at mealtimes and offer them throughout the day. Keeping a water bottle next to the bed or a favorite chair can help those with mobility problems.